Jessie is a corporate lawyer in a Manhattan firm - Lina is a community college dropout and born-and-bred Long Islander. They don't seem to have anything in common, but marooned at home with infants, they strike up a fast friendship. In the yard between their houses (as far as their baby monitors will reach), they bond over sleep deprivation, unreliable childcare and "having it all." 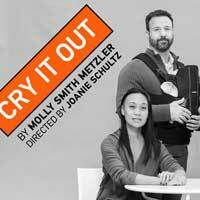 A candid comedy about who gets to make which hard choices in the tinderbox of parenthood and class in the United States, Cry It Out can be enjoyed at the Studio Theatre in Washington, DC. "...Top-notch, believable acting from the entire cast allows us to go along with the characters on their emotional rollercoasters. The playwright is skilled at seamlessly transitioning from the fun and lighthearted moments to the serious ones and each actor is equipped with the skill to play them just as seamlessly under Joanie Schultz's intelligent direction." "...Director Joanie Schultz maintains a naturalistic flow that echoes the women's utterly realistic, often profane, frequently hilarious conversation. Thomas shines in the standout role: Lina is down-to-earth, Italian-American, and says whatever she wants with no apologies. Gavino conveys a sense of releasing long-held tensions, while Andino and Klein maintain enough distance from the other characters that misunderstandings are certain to follow." "...While Cry It Out is a clear-eyed look at maternal stresses in today’s America, it is also swift-moving and laugh-out-loud entertaining. Joanie Schultz has assembled a first-rate cast and directs them with assurance. Ranging from deadpan to devastating, Dina Thomas is spectacular as the wise-cracking Lina, an unsophisticated yet gutsy South Shore girl whose childcare options are limited to her boyfriend’s wine-addled mother." "...The snappy, comedic play is heavier than it might appear at the outset. Though some of Cry It Out’s plot twists are pretty well-telegraphed from the beginning, the play manages to keep the audience guessing. Those unpredictable turns are some of the best ways Smith Metzler upends and questions assumptions and cliches about motherhood."